Does Eating Sodium Make You Sweat? Contrary to popular belief, sodium and salt have entirely different chemical designs and should not be mistaken for each other. 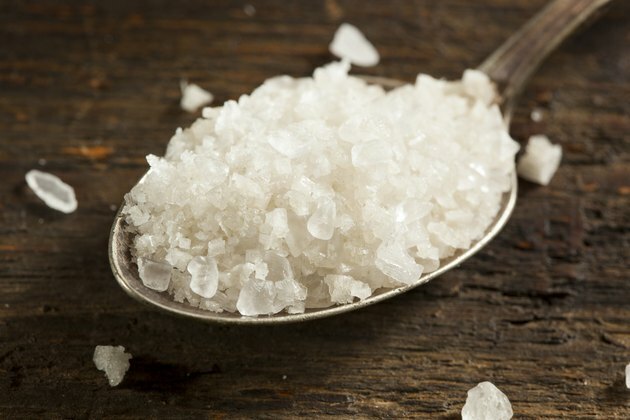 Unlike pure sodium, salt is made up of a combination of both sodium and chloride. The amount of sodium an individual requires depends entirely on genetics, current health and level of physical activity. Consult with your medical adviser before you drastically reduce or increase your sodium intake. The body requires a sufficient amount of sodium, found in many sports beverages and food products, in order to function. Sodium is an electrolyte that not only serves to regulate hydration within the blood and the surrounding cells but also preserves proper nerve and muscle activities. If there is a sodium imbalance, balance may be achieved either through consuming more liquids to dilute the sodium or consuming foods or sports beverages to replace lost sodium. The Centers for Disease Control and Prevention recommends that an average sodium intake for children over the age of 2 and adults should not exceed 2,300 milligrams per day, but this figure is also dependent on level of physical activity. Sweating, otherwise known as perspiration, is defined by National Institutes of Health website Medline Plus as "the release of a salty liquid from the body's sweat glands." While research is not sufficient to correlate sweat levels to sodium intake, Medline Plus says that increased perspiration may be connected to an individual's number of sweat glands, genetics, alcohol or caffeine consumption, medication, physical activity or warm temperatures. Not enough sodium and too much sodium can both be detrimental to your health. Too little sodium may impair bodily functions, such as inflammation of the cells. This may lead to health issues, such as chronic headaches, fatigue, nausea, seizures or decreased consciousness. Too much sodium may result in increased water retention, which is a leading cause of high blood pressure, kidney failure and hypernatremia. The kidneys function to filter out toxins and excess sodium from the body. If there is more sodium than the kidneys are able to filter out, the sodium will accumulate in the blood, also known as hypernatremia, and kidney failure may ensue. Hypernatremia may be treated by consuming fluids in an effort to restore sodium balance. A high concentration of sodium in the blood, if left untreated, may result in confusion, muscle spasms or death. The bottom line is there is no known relationship between sodium intake and level of sweating. How much an individual sweats is based primarily on genetics, body temperature and physical activity. Although sodium levels and amount of sweat are completely unrelated, sodium levels should still be monitored, especially if you have health concerns or engage in strenuous physical activity. Do I Need Extra Salt When I Sweat a Lot?